Andrew Ellicott, “Andrew Ellicott,” Histories of the National Mall, accessed April 22, 2019, http://mallhistory.org/items/show/105. Andrew Ellicott was a surveyor employed by President George Washington to survey the boundary lines of the federal Territory of Columbia, which became the District of Columbia. His survey team included his younger brother Joseph and Benjamin Banneker, a self-taught African American surveyor. The team laid the boundary stones of the 100-square mile borders of the District. Ellicott also completed and revised the original city plan of Pierre Charles L'Enfant. New York Public Library. View original image. Ellicott was born to a Quaker family in Pennsylvania where his father worked as a millwright and clockmaker. As a teenager, he studied math, astronomy, and other sciences. Shortly after Andrew married Sarah Brown in 1775 he moved with his new bride to his father's Maryland property to oversee the mills. During the Revolutionary War, Ellicott joined the Continental Army and rose to the rank of Major. Ellicott first worked as a surveyor in 1784, helping to determine the boundary between Virginia and Maryland. In 1789, he moved his family from Baltimore, where he had been working as a teacher, to Philadelphia to take a job as a federal surveyor. President Washington commissioned Ellicott in 1790 to survey the boundary of the newly established Federal Territory on the Potomac. While in the area, he also conducted surveys within the district for private landowners. In 1801, he refused an appointment as Surveyor General of the United States because he preferred field work to being an administrator. He accepted an appointment in 1813 as professor of mathematics at the United States Military Academy at West Point, a position which he held until his death in 1820. Silvio A. Bedini. 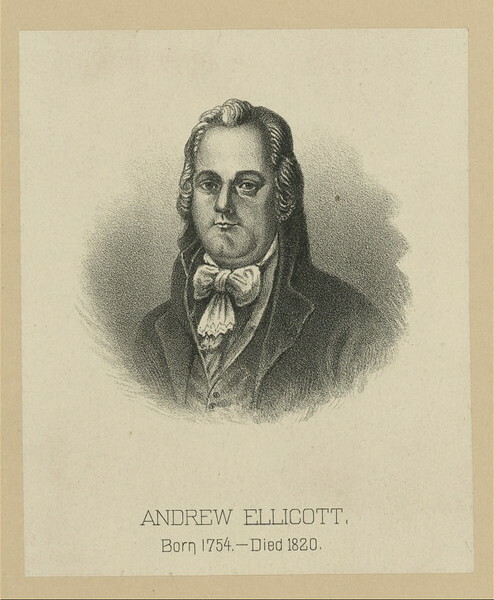 "Ellicott, Andrew". In American National Biography Online. Oxford University Press, 2000.